Your doll will be cozy in this fun poncho. The PDF pattern includes two variations: cowl neck and split neck, and can be made with a variety of knit fabrics. The Split Neck Variation can even be made with flannel. Recommended Fabrics: Lightweight or medium weight sweater knits, medium weight jersey knit, and micro fleece. Up-Cycling sweaters is a great source of fabric. Flannel can be used the split neck version ONLY. The binding and neck pieces MUST be cut on the bias. Love this pattern. 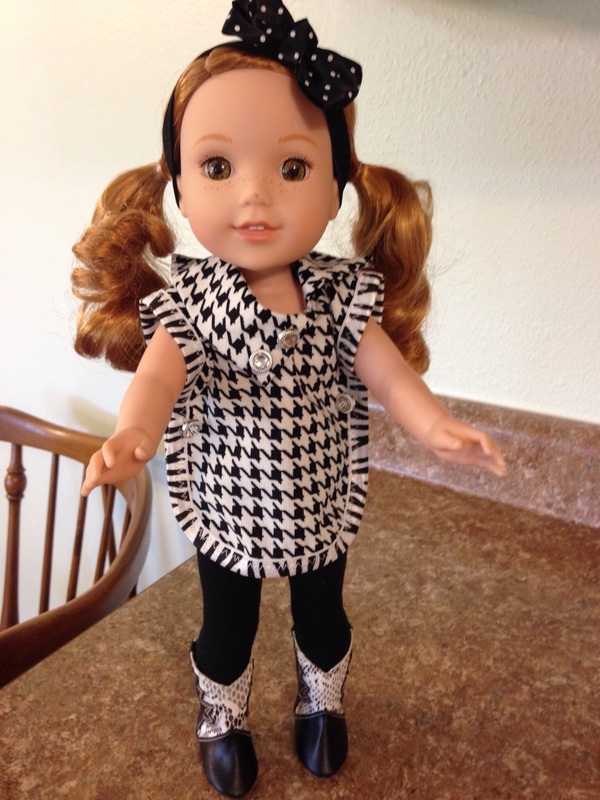 I made it for my granddaughter ‘s Camille Welliewisher doll as a Christmas gift. I failed to take a pic before mailing. I found the pattern straight forward and easy to make. I crafted it from my granddaughter’s outgrown fleece pajamas. That made it an especially fun project. I made it and the granddaughter loved it. This turned out SO cute! I made it from a print stretch velvet and used a contrasting black for the binding and collar. Good instructions. You will not go wrong with this pattern.